I don’t know about you guys, more about but I needed a break from all of the eating and drinking I did last weekend. This week it’s all about detox. None of that liquid-only stuff, just real, good, whole foods. These stuffed eggplants and peppers might not be ultra-gourmet, but they’re healthy and easy to make and taste pretty darn good on a weeknight. Instead of stuffing my vegetables with the traditional ground beef, I used mixed whole grains. Usually, I have a few containers of frozen farro or quinoa in the freezer, but I find that these grains from Seeds of Change work great in a pinch. I mixed them up with some tomato sauce, smoked paprika, sherry vinegar and cayenne pepper and stuffed them into a halved eggplant and red pepper. 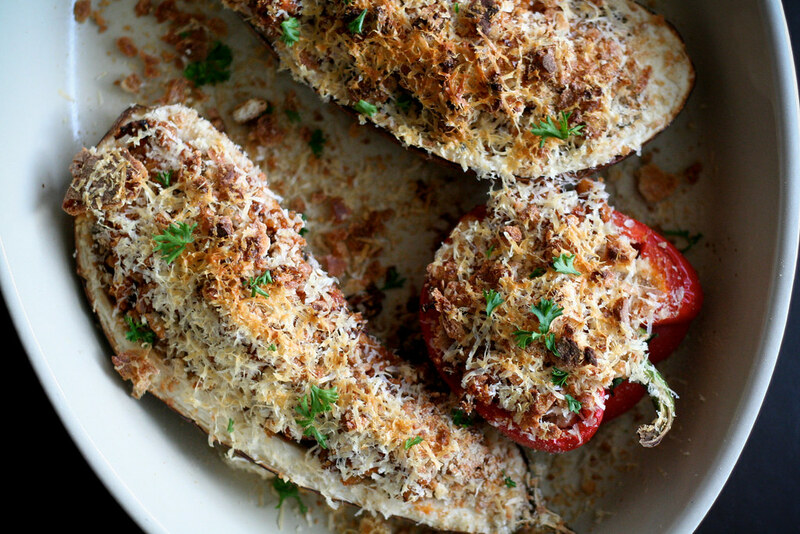 Fresh breadcrumbs and Parmesan cheese were sprinkled on top and it went into the oven for a half hour. I really liked how simple the dish was and how hearty it tasted. Next time I think I’ll add some chickpeas to make it even more substantial. After eating this for a couple of days, I feel great! I’m all ready for more cookies and pasta and beer. Everything in moderation! You can use 2 eggplants or 2 red peppers instead of a mix if you prefer. Also feel free to experiment with different kinds of beans. Preheat the oven to 350° and grease a large, shallow baking dish. Mix together the grains, tomato sauce, paprika, vinegar, salt and cayenne pepper. Set aside. Halve the eggplant and pepper and scoop the seeds out of each. Place them in the baking dish, cut side face-up. Spoon the grain filling evenly into the eggplant and pepper halves. Sprinkle the top evenly with the greadcrumbs and Parmesan cheese. 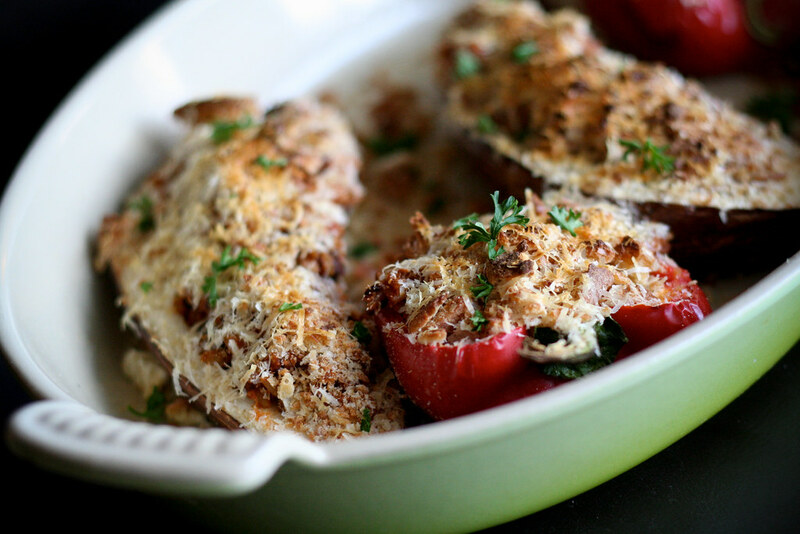 Bake for 30 – 35 minutes, or until the eggplant is tender. If your cheese isn’t browned, turn the broiler on for just a minute, pulling the dish out as soon as it’s browned. Makes 4 entree-sized potions when paired with a salad. Looks so delicious!!! Love the grains instead of meat in these. The chickpeas are a great ingredient. They’re so full of flavor and body. This looks like a classic recipe. I’m sure that I’d love it. I made these about a month ago for the first time and yummmm!!!! They are delicious and hit the spot! I continue to make them and even the kids love them! Thank you! They work as an offshoot for your business extending your organizational goals and value to fulfill business expectations. to fulfill the expectations from web based applications.